Maps come in many forms, including their online versions: Google maps, Ordnance survey maps, historical overlays (Walking through time), crowd sourced maps (Open Streetmaps), with GPS features, alerts, spoken directions, and provision for selling and sociability (Foursquare). Maps show us where we are, help us to get where we want to be, and they represent something. This much is obvious. But what do they represent? As maps are such active media, made with some purpose in mind, it’s helpful to focus on the verb, to map. In mathematics to map is to associate the elements of one set with those in another. For example, all the alphabetical characters (a, b, c …) map onto numbers (97, 98, 99 …) through the ASCII chart of correspondences. You could also map apples, bananas and peanuts onto horses, monkeys and squirrels according to some sensible or arbitrary mapping function. 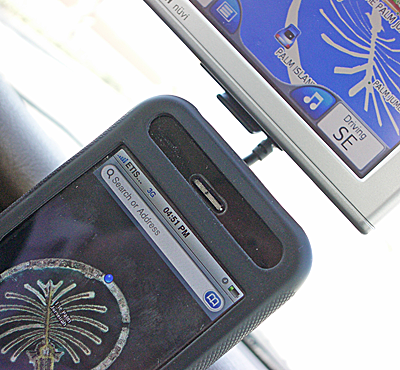 It’s helpful to think of maps in this way, as one set of interrelated symbols corresponding to (mapped on to) some other set of interrelated symbols, as in this photograph of two different systems — an aerial view on an iPhone, corresponding to a perspective view on a vehicle’s SatNav. Now such mappings are provided on the same device, or even the same app. So maps map to other maps. Models map to models; one term in a metaphor to another; this as that; one frame of reference against another. It’s a basic tenet of Structuralist linguistics — language as the circulation of signs. The intellectual tactic here is to sidestep the problematic entity of reality. Mapping practices (and cartography) are contingent on the circumstances in which a map is made and deployed. Maps also derive from instruments of measurement, sensors, observational practices, symbolic conventions, rules, and algorithms. Accuracy and usefulness are matters of fit between the systems being mapped, and the reliability of the mapping processes — something to do with calibration, as I considered in The Tuning of Place. Freeing maps from the need to represent what’s there is good news for emotional mapping, of the kind developed by the Situationists and their successors, though that demands a bit more thought, and imagination. Corner, James. 1999. The agency of mapping: Speculation, critique and invention. In D. Cosgrove (ed. ), Mappings: 231–252. London: Reaktion. Hadlaw, Janin. 2003. The London underground map: imagining modern time and space. Design Issues, (19) 1, 25-35. Holmes, Brian. 2008. Do-it-yourself geopolitics: Map of the world upside down. In PEVRAV (ed. ), Urban Act: A Handbook of Alternative Practice: 300-306. Paris: European Platform for Alternative Practice and Research on the City, Atalier d’Architecture Autogérée. Rueb, Teri. 2013. This is (not) a map. In R. Buschauer, and K. S. Willis (eds. ), Locative Media: Multidisciplinary Perspectives on Media and Locality: 137-150. Bielefeld, Germany: Transcript Verlag. Schultz, Deborah. 2001. The conquest of space: on the prevalence of maps in contemporary art. Essays on Sculpture. Leeds, UK: The Henry Moore Institute. Apart from the multiple inner elements in map which have been discussed in the artible, the map itself have its own metaphor. Before we got maps apps, a tellurion or a world map used to be an indispensable thing in most people’s home. From the perspective of metaphor, it can be treated as a symbol of our (imaginary) horizon and ambition. — Nowadays, it still give us an illusion of being prevalent, as we can know barely every shops, every activities, even where our friend is nearby, although we actually alone in toilet. If not (being admitted) , it at least provides us a sense of presence and orientation through the tiny arrow when we get lost. Moreover, the brain map and interpersonal map is also some interesting points when it comes to metaphor. Because rather than being a symbol to some objects that actually exist, it aimed at present the relationship between abstract objects, and how can this kind of things turn into a visual symbol is where the hardest metaphor lies in.